I love cooking. I only talk about it every so often. I have to give credit to two people who made it enjoyable. Above all is Mom who I spent a lot of time watching cook for the 4 of us kids. I was lucky enough to be her third hand when she would need someone to stir or make sure something didn't burn. You learn a lot from this. I still don't know how to cook half of what I love of hers but it is kind of difficult doing that when she cooked for 5 to 6 people and I don't. 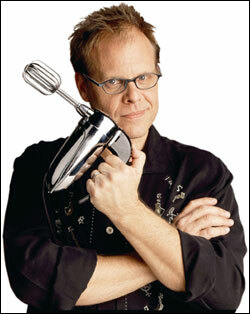 The other person that stoked my interests was Mr. Alton Brown who hosts Good Eats on The Food Network. I know, there are a lot of chefs out there and a lot of them make it look fun. But, watching Emeril and Wolfgang, I find that I don't understand why they throw items in a dish. Alton attacks food with a scientific eye. He shows how certain molecules react in a dish, why searing one side of a steak might not seal in moisture and egg whites are nature's glue all with a kick of humor and history. Cooking has always seemed like such an arcane art until I first caught the show. Bam! Kick it up a notch! But, I actually feel that I'm walking away with an education after every episode. If you haven't seen an episode yet do try. I really like Good Eats. I have never tried a recipe from him, but his zany personality makes learning about cooking fun. I will absolutely watch him. God help me, I'm just no good in the kitchen. Maybe a touch of science will help! I like this show too. Along the same lines, I also enjoy Gardening by the Yard with host Paul James. Even though I have a black thumb and am not a great cook, I am entertained and learn something new from these shows. I'm going to have to check this show out... I love the Cooking Channel, but haven't seen this show. Perhaps I can learn something to add to my list of macaroni and cheese and... oh damn that is the list! As I don't have cable, I don't get to watch all the cooking shows. I really like a show on PBS called Cucina Toscana.